Cheestan – Its a Nerd’s Life! At the Rampur Raza Library, I saw a delightful book called Cheestan, whose description I had read in Katharine S. Diehl’s article, Lucknow Printers 1820–1850. Printed in 1839, this is by far the oldest children’s book I have had the pleasure of seeing up close. 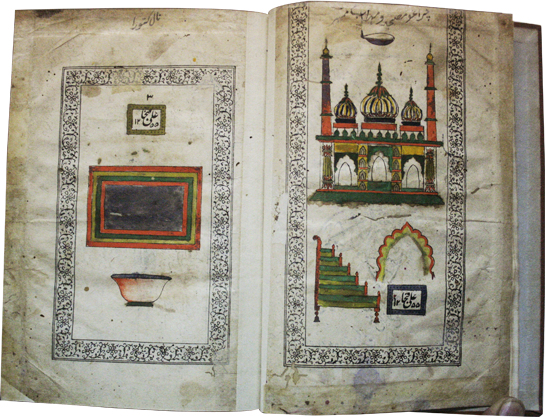 The book was produced by the Mohammadi Press, where it was lithographed and hand-colored. The title page, which doesn’t have any colour, features the full name of the author, Zafararrudaulah Muazzamamuddaulah Futeh Ali Khan Bahadur in a calligram shaped like a six-petal flower. 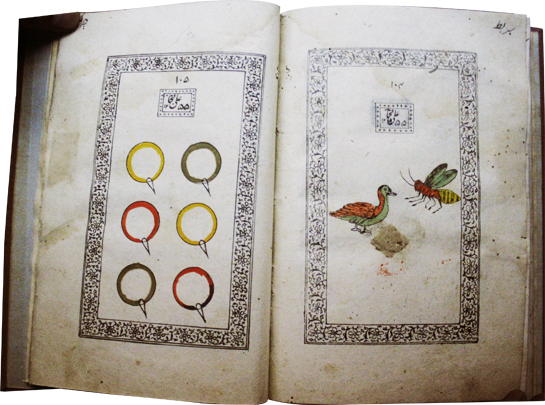 Another book with its hand-colored illustrations is a book of puzzles: Futeh Ali Khan’s Cheestan (Mohammadi Press, 1839). Each page has two small pictures. If you think of the name of the object in each picture, and you say these names successively in the Persian language, and you will say a proper word. Of all ingenious books, here is one of the loveliest that I’ve seen anywhere in any language: a beautiful children’s book now 130 years old which makes learning a foreign language a pleasant game, a book which is neither beneath the dignity of an adult to enjoy, not too difficult for a child. The difficult lighting and space in the library wasn’t exactly ideal for photography, but I tried. My sincerest thank you to Mr. Naved Qaisar and Dr. Mohd. Irshad Nadwi, who helped me access this and other books I wanted to see, but couldn’t find since I couldn’t read the Urdu catalogues; and translated the title pages and colophons of the books I consulted.